Glacage Embossing Crème is a furniture refinishing texture medium used to transform furniture and cabinetry into fantastic custom creations. Glacage is an acrylic, water-based, thick texturing cream that mimics the look and feel of intricately carved wood. Create beautiful textured finishes over wood, cabinetry, and previously painted furniture. Glacage can be applied directly to raw wood pieces. For previously painted surfaces, lightly sand surface or prime prior to applying Glacage. You may add water to thin Glacage if desired. Spread luxuriously creamy Glacage through a stencil to create a raised design or apply allover for a textured look. A variety of tools can be used to apply Glacage including trowel, off set knife, sea sponge, spatula, putty knives, and paint brush. Soap and water cleanup! To Use: For a crackled effect, apply Le Craque crackling medium and allow it to dry prior to applying Glacage. Cracks will appear as the Glacage dries. Cracks will also naturally occur where Glacage is applied in a thick manner or when drying is accelerated with heat. 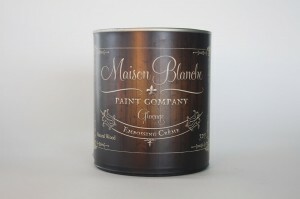 Allow Glacage to dry completely, sand away any imperfections, and paint with Maison Blanche Furniture Paint. Protect your finish with Antique wax or polyurethane. Click here for videos on Maison Blanche Paint!